The Lockerbie bombing is an open wound. It is one of the 20th century’s most horrific events. Yet, despite the murderous act being well within living memory, nearly all aspects of it have taken on the mantel of myth and mystery. The fall of the Ghaddafi regime with its prospect of shedding new light on the atrocity rekindled public interest and opened up the various, latent conspiracy affairs. Malta, as the alleged origin of the bomb’s journey, is a key protagonist in any account of the Lockerbie bombing. The staging of the drama ‘The Lockerbie Bomber’ in Malta this autumn is bound to be more than merely thought provoking. 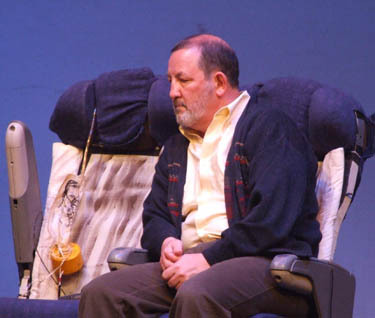 Few of us in Malta will encounter the script as a passive audience; the play by Kenneth N. Ross is an incredibly powerful rendering of the aftermath of the Lockerbie disaster. It challenges public understanding of the event from three different perspectives; that of two parents who lost their young child in the crash; two journalists trying to piece together what happened on that fateful day; and two government officials with information to guard. The play has just been on stage at the Alman Theatre, Alloa, in Scotland. Here in Malta, director Herman Grech and DnA Theatre, headed by Alan Montanaro and Denise Mulholland, are planning to stage the play at St James Cavalier in October. Herman Grech, who has followed closely and reported on the Lockerbie affair in his career at The Times of Malta, talks to us about the background to the play and the power of staging it in Malta. Q1. The Lockerbie ‘affair’ has been of keen interest to you professionally for many years; it’s not simply something you came across now in its dramaturgical form as a provoking piece to stage. Can you talk us briefly through your background interest in Lockerbie? I vividly remember watching the horror unfold on BBC TV at my brother’s London apartment in December 1988, as the Christmas lights flickered. Two hundred fifty-nine were on board; another 11 killed on land. It was surreal. Years later, the Malta connection emerged, the ‘bad guy’ was netted and the rest is history. Or so we thought. After Megrahi was locked up it emerged that the court was denied vital evidence which, had it been heard, would have probably led to a different outcome. Some of that evidence was sensational, and hence the theories. As a journalist, I have tried to keep these legitimate questions at the top of the agenda. Q2. You are widely read on the Lockerbie bombing in journalistic and legalistic accounts but what attracts you to this script in particular? The Lockerbie Bomber is a new play and I felt it beautifully blended fact with fiction. Parents of a victim relive the bombing in its vivid, horrific detail. The two journalists’ characters are impeccably close to anyone who’s worked in the field. Then you have the government agents who animate the script. But most of all, I felt the script should challenge even the most cynical audience member to start asking questions and demand answers following the outrageous revelations which emerged just a few years ago. Q3.Can a drama unturn more stones or provoke new responses to the Lockerbie affair, an event that has been well worked in the news? It’s in the interest of some governments to ignore the legitimate questions raised about the case, and understandably so. The western world has been fed the story that a Libyan man and his country’s despotic regime were responsible for the worst terrorist atrocity on British soil. The play is already triggering off controversy for different reasons. A drama can be effective because more than the casual newspaper or news portal reader, in a theatre you are guaranteed a captive audience, some of whom might be teased into knowing more, and demand the truth. Q4. What is Malta not confronting about Lockerbie that you feel this play will force us to confront, or at the very least make us uncomfortable about? Is this an ideal juncture to reopen the issues here? Several arguments have been made to prove this could have been a gross miscarriage of justice, so there should be no time bar. The Maltese government has consistently said the bomb never departed from Luqa airport. If that is the case then Megrahi is innocent, plain and simple, yet it remains reluctant to say so. The only thing which linked Megrahi to this atrocity is the fact that he supposedly bought the clothes in which the bomb was wrapped, a claim he vehemently denied. Meanwhile, the original court case conveniently made no mention of the fact there was a break-in at Heathrow airport hours before the disaster, or that the Maltese witness allegedly had been paid by the Americans. What was the real reason Megrahi was released? So many questions, but few answers. Q5. You have spoken several times to Dr Jim Swire, father of a Lockerbie victim and a key campaigner for justice and transparency in the Lockerbie affair. How significant do you feel his voice has been in prompting this creative angle to readdressing the issues behind the bombing? Jim Swire’s 23-year-old daughter was killed in the bombing. Would any parent speak and campaign the way Dr Swire did if he had the slightest suspicion that Megrahi could have been behind the bombing? Megrahi has since died, and Dr Swire and his campaign team still want the truth to emerge. It’s impossible for anyone who truly believes in justice to ignore his calls to at least probe the facts which emerged after the Lockerbie ‘bomber’ was jailed. Q6. What do you envisage as the greatest challenges to staging it in Malta? I’m assembling a top cast because the play is a 75-minute rollercoaster of emotions. It’s tragic in parts, thrilling in some sections, and even funny in others. The biggest challenge would be to ensure the audience understands the pertinent questions and why, perhaps, this remains one of the biggest secret of our times. I would like Maltese audiences, hopefully the government, to understand why a group of people who have nothing to gain, including parents of victims, have been harking for the case to be reopened, even now that Megrahi is dead. The BBC ran a piece on the prospect of Malta staging “The Lockerbie Bomber” here. Photos: courtesy of the producer, Alman Theatre.